Wed, Feb 6, 2019, 12:23 am SL Time, ColomboPage News Desk, Sri Lanka. Feb 05, Colombo: The Leader of the House of Parliament, Lakshman Kiriella presented the Bill entitled "Appropriation" today (Feb 05th), to provide for the service of the financial year 2019. In addition to providing for the service of the financial year 2019, the Appropriation Bill is presented to authorize the raising of loans in or outside Sri Lanka, for the purpose of such service and to make financial provision in respect of certain activities of the Government during that financial year. The Bill is presented for approval "to enable the payment by way of advances out of the Consolidated Fund or any other fund or moneys of, or at the disposal of the Government, of moneys required during that financial year for expenditure on such activities; to provide for the refund of such moneys to the Consolidated Fund and to make provision for matters connected therewith or incidental thereto." 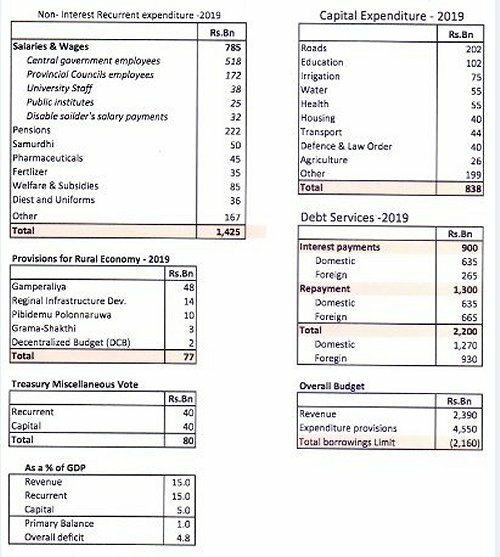 The Appropriation Bill estimates 4.55 trillion rupees (approximately US$ 25 billion) as expenditure for its services for the financial year of 2019 while the state revenues for 2019 is expected to be Rs. 2.39 trillion. The government has set a borrowing limit of Rs. 2.16 trillion while expecting to raise government revenue to 15% of GDP and keep the budget deficit at 4.8%.